Recently named one of the Top Twenty Events in the Southeast by the Southeast Tourism Society, Appalachian State University's major summer arts attraction will celebrate its 35th anniversary season from June 29-August 3, 2019. This month-long whirlwind of music, dance, theatre, visual arts and film programming is held in venues across the university campus. Art in the Park was created in 1962 by a handful of area artists and craftspeople to showcase local talent. Art in the Park is host to 90 artisans at each show. Some of the best local and regional artists and craftspeople showcase their handcrafted jewelry, pottery, fiber, glass, photography, painting and more. Art in the Parkâ€™s high standards and professional jury attract artisans from all over the Southeast to exhibit in a series of six shows, May through October. The quality of work exhibited draws thousands to the mountains each month. The Blowing Rock Art & History Museum (BRAHM) presents an annual celebration of Art & Antiques. View and purchase some of the best heirloom-quality furniture, pottery, jewelry, clocks, crystal, silver and more. Featuring selected vendors from throughout the East Coast, the event is open to the public for the entire weekend. One ticket is good for every day of the event. The Blowing Rock Charity Horse Show began in 1923. Originally the event lasted for five days, but over the years it has grown to cover a period of three weeks. 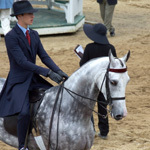 The show is held at Blowing Rock Equestrian Preserve. Steeped in tradition, this event has consistently attracted annual exhibitors from all over the United States and several foreign countries and has the distinction of being recognized as the oldest continuous outdoor horse show in America. All of those associated with the show welcome you to the "Highlight of Blowing Rock's Summer Season." You can enjoy the show from the famous grandstand, from your own special box, or along the rail at the In Gate. Held each year during the first weekend of April, the Blowing Rock Trout Derby celebrates the opening of trout season in the High Country. Event hours begin at dawn on Saturday. There is no entry fee and registration is not required. Just bring your catch to the American Legion to be measured. Trophies will be awarded at 4:30pm on Saturday in five categories: Men, Women, Girls (12-14), Boys (12-14) and Small Fries (11 and under). Any trout caught in NC public waters on Derby days are eligible for prizes. 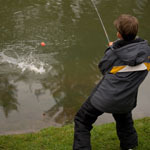 Kids can fish at Broyhill Lake and licenses are not required there. There is a limit of 3 fish per day at Broyhill Lake. Other nearby fishing spots for the Derby include Bass Lake, Trout Lake and the Middle Fork River along 321. Fishing licenses are required to fish in these areas, and NC Wildlife fishing regulations apply. Licenses and bait can be purchased at Village Hardware on Green Street. Join the Village of Blowing Rock as we celebrate the fun side of winter at the Annual Blowing Rock Winterfest! From the Wine Auction and Live Music, to the Chili Cook-Off, Kid's Activities,and the Polar Plunge in Chetola Lake, there's something for everyone! Shop with Blowing Rock Merchants!Dine in our cozy restaurants! Free Hayrides!Free Shuttle Service! FREE SNOW! 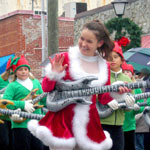 The Town of Blowing Rock celebrates the holiday season and lights the town! Join in the fun with free entertainment, music, and visits with Santa. The annual Christmas Parade makes its way down Main Street. Then, watch as the Mayor flips the switch for the Main Street wreaths and Town Hall tree! Free outdoor concerts in Memorial Park featuring a variety of music and entertainers. Past musical genres have included blues, pop, classic country, traditional bagpipes and more. Always on Sunday afternoons following Art in the Park, May-September. Bring a lawn chair or a blanket. 2015 dates: June 14, July 19, August 16, and September 13. 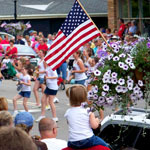 Join the Town of Blowing Rock for our annual festival and small-town parade! Held on the weekend closest to Independence Day. Enjoy festivities all weekend long, with free entertainment, music and games, and the Main Street parade. This 50 year tradition continues in spirit and song with town sponsored concerts in the Broyhill Park Gazebo on the Lake. E.J. & Shirl's Farm House, Live! Singers return with great vigor & variety, and the magic of the music.Free to the public. Also available for dinner concerts & very special occasions. Call Blowing Rock Parks & Recreation for details. Join us for a fabulous four-day festival showcasing wineries from North Carolina and from across the globe. Among the many events are Taste!, The Grand Wine Tasting, The Reserve Tasting, wine seminars, cooking classes, winemaker's dinners and much, much more! The symphony performance at Chetola Resort is one of the most highly anticipated events of the year. Come see for yourself why people have fallen in love with this experience year after year. Sit by the lake in the cool mountain breeze, and watch the swans drift by. Bring a picnic, or sample delicious cuisine prepared by Chetola's chef. Immerse yourself in the delightful sounds of the Symphony of the Mountains as the evening slips into night. And the spectacular fireworks, so close, so bright, will take your breath away.